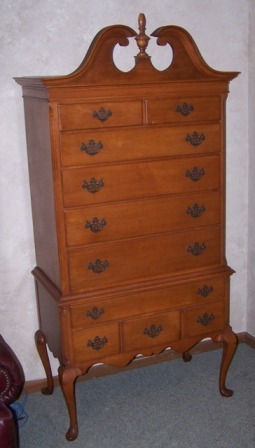 Our Mission at Klinginfo.com is to preserve the historical record and legacy of Kling Furniture. We collect, archive and distribute information about Kling Furniture to educate owners and assist vintage furniture collectors and dealers. See About Klinginfo.com. Information about Kling Furniture Replacement Pulls: Click Here. NOW AVAILABLE! September 2018! Pull Hardware in stock: $9 to $17 plus S&H Buy Replacement Hardware on this Website. See Our Vintage Tips section for questions about how to clean, refinish, and get the most value out of your high quality vintage Kling Furniture. Family Heirlooms: Kling Furniture is high quality and will last for hundreds of years if properly cared for. Many existing Kling pieces will be official 100-year old antiques in just thirty or forty more years. Imagine how the emotional and financial value of this furniture can be enhanced with proper identification and documents. Selling: From a buyer’s perspective, uncertainty will lower the price. With Klinginfo.com research and documents your buyer will be confident about the quality, authenticity, age and wood type of the Kling furniture they are buying. $10 worth of documentation can add hundreds to a set of furniture at an estate sale. Buying: Looking at Kling furniture on eBay or in a vintage furniture store? How old is it? Are you confident about the wood type? If you know the item number stamped on the furniture back or can provide a photo and brief description via email, we can verify the age and wood type for just $10. identified as Kling. A shipping tag or a three digit stamped number on the back can match our archival records. one below to sell for $500 to $1000 depending on condition and sales venue. Klinginfo.com is operated by the descendants of John Alexander Kling and his son Arvid John Kling. 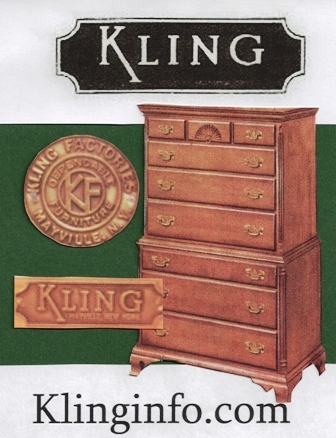 John Kling founded Kling Factories in 1911 and Arvid Kling was President between 1934 and 1955. Klinginfo.com owns thousands of documents and images related to the Kling Factories. Klinginfo.com was established in 2008. See Customer Testimonials. This is a part-time family business. Our customer services are not affiliated with or subsidized by any corporation. We seek to answer all inquires to James.Kling@yahoo.com but for fastest service we recommend the instant products or the 24-48 hour Personalized Express Research Service. Specific date verification and discussion of value are discussed with paying customers only. The images of furniture used on the Klinginfo.com webpage and Klinginfo.com publications are either owned by Klinginfo.com or are being used with the expressed written permission of Ethan Allen Global, Inc., which owns the Kling brand name. Print reproduction or website re-posting of Kling Furniture images found in Klinginfo.com publications or the Klinginfo.com website is allowed only with expressed written permission from Klinginfo.com. If for any reason we cannot provide the research services you have purchased, we will provide a refund. Even for the instant PDF products, a personal follow-up with a Kling family member is included and we will work with you to be sure you are getting useful information about your furniture. We refund some or all of the $10 Express Service if we do not have information or if the documentation we have is of minimal value. Klinginfo.com research letters, documentation, verification statements, publications, and value statements are based on the best available information we have at the time the research is conducted. If we do not have a high level of confidence about the age or other information about a suite style we are evaluating, we will state such. When information is available, we make every effort to ensure that the information we provide you is accurate. However, the nature of evaluating vintage furniture using historical documents is imperfect. Therefore, Klinginfo.com cannot be responsible for any potential loss of value to our customers or web site viewers if the age or type of furniture is inaccurately estimated. If for any reason we cannot provide the research services you have purchased, we will provide a refund. Your privacy is very important to us. We are a family business and genuinely respect you and your personal information. Klinginfo.com will not sell or share your name, email, physical address or other personal information with any other business, organization, or person. Klinginfo.com does not maintain any financial or payment information about our customers. All financial transactions are handled in a secure manner by our host merchant BigCommerce.com and Paypal. Klinginfo.com will use your email and address for two purposes only—to complete a transaction you initiate—and to inform you of significant new products or services offered by Klinginfo.com itself (this will be rare).